Perfect for wearing on its own or layering over one of our tanks. 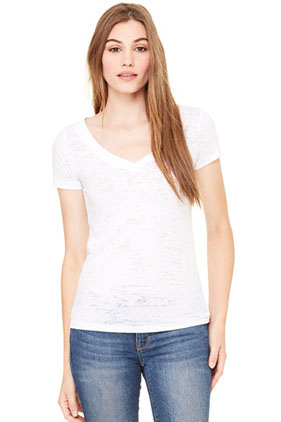 55% Airlume combed and ring-spun cotton/45% polyester, 36 single 3.1 ounce burnout v-neck women's t-shirt. Sideseamed. Solid rib neckline. Short sleeves and sweetheart V-neck with solid rib trim. Semi-relaxed fit. Try a reverse print for a cool, unique look.